Founded in 1903, Aciera was Switzerland’s largest manufacturer of milling and drilling machines. Based in watchmaking municipality of Le Locle, in the heart of the Jura mountains, Aciera initially produced machine tools for the horological industry. With the worldwide burgeoning of precision engineering throughout the 20th century, not least driven by military research and development, Aciera, like many other Swiss machine tool builders, expanded the size and range of their products. 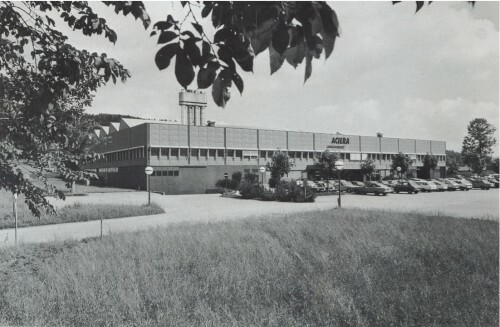 Outgrowing the original factory in Le Locle, in 1973 Aciera built an additional 14,000 square metre production facility 6km away at Crête-du-Locle. In 1987 total staff stood at 260 people. 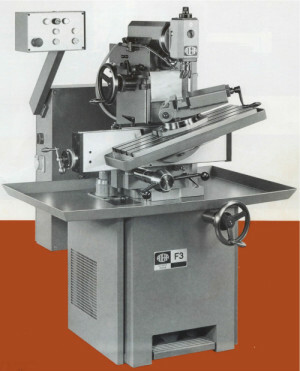 By the end of the 1980s total historic production of Aciera machines was well in excess of 50,000 units, and according to its 1987 sales literature, between 1983 and 1987 sales had doubled. Perhaps such claims betray a need to satisfy the accountants, but despite the apparently buoyant condition of the firm in the late eighties, by 1992 Aciera were bankrupt. I’d be interested to know the exact reasons for their demise, but it’s probable that they were a victim of over expansion coupled with the world economic recession of 1980s – if anyone can shed more light please contact me. It is clear that Aciera subcontracted a considerable amount of its production – especially individual components and accessories. However, complete machines were also built off-site. The F2 machines were apparently built by a technical college in the German speaking part of Switzerland, and at some point production of the F1 and F3 was subcontracted to Pizzi & Co who continued to make the F1+ (and possibly the F3 too) after Aciera had ceased trading. Following liquidation, the Indonesian Texmaco Perkasa group acquired the Aciera name and production rights, and began making the F3 milling machine and a range of drilling machines to original Swiss designs as well as producing Bridgeport type turret mills and other CNC machines. During a visit to Switzerland in the early 2000s I encountered an Indonesian produced F3 and it was very apparent from a cursory inspection that it was not up to Swiss production standards. The vendor (a well established machine tool dealer) told me that Swiss personnel had helped establish the Jakarta factory, training Indonesian workers and overseeing the first machines produced and that these had been of very good quality. However, standards fell very quickly, and the punch-marked pin-nut of the F3’s rapid traverse bore witness to this. By the mid 2000s Indonesian production had ceased, and I believe that the Aciera name returned to Swiss ownership. On the second-hand market the F3 is the most common of the Aciera machines. I don’t have a clear idea of how many of these machines were produced, but, based on twenty years of experience in the market, I would guess that they constituted something between a third and half Aciera’s total post war production, with the F1 being the next most numerous followed by the F4 and F5 respectively. I believe that the F2 was produced in extremely small numbers – probably less than 100 in total, but this is merely speculation based on rumor! A near paint colour match for the grey of mid 60s onward machines is RAL 7031, but I’m also informed that a colour scan of the inside of a cover produced a match to NCS S6010-B10G. If you have further information about Aciera machines or about the history of the firm please contact me.